Lip color: Whether it’s a pink, peach or red, a pop of color is perfect for those grey winter days. Sun block: Cloudy skies don’t mean you can skip reapplying SPF throughout the day. 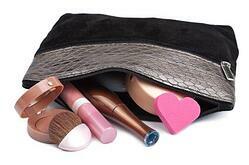 Schedule a makeup audit in our Skin Clinic and let our estheticians help you update your makeup bag! Call Mercy Medical Group Plastic Surgery and Laser Center to book your appointment today at 916.536.2400.